Stamford is a city in Fairfield County, Connecticut, United States. According to the 2010 census, the population of the city is 122,643. As of July 1, 2013, according to the Census Bureau, the population of Stamford had risen to 126,456, making it the third largest city in the state and the seventh largest city in New England. Approximately 30 miles from Manhattan, Stamford is in the Bridgeport-Stamford-Norwalk Metro area which is a part of the Greater New York metropolitan area. Stamford was known as Rippowam by the Native American inhabitants to the region, and the very first European settlers to the area also referred to it as such. 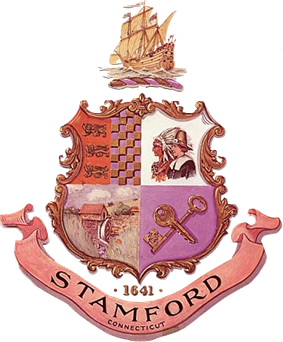 The name was later changed to Stamford after a town in Lincolnshire, England. The deed to Stamford was signed on July 1, 1640 between Captain Turner of the New Haven Colony and Chief Ponus. By the 18th century, one of the primary industries of the town was merchandising by water, which was possible due to Stamford's proximity to New York. In 1950, the Census Bureau reported city's population as 94.6% white and 5.2% black. In the 1960s and 1970s, Stamford's commercial real estate boomed as corporations relocated from New York City to peripheral areas. A massive urban redevelopment campaign during that time resulted in a downtown with many tall office buildings. The F.D. Rich Co. was the city-designated urban renewal developer of the downtown in an ongoing redevelopment project that was contentious, beginning in the 1960s and continuing through the 1970s. The company put up what was the city's tallest structure, One Landmark Square, at 21 floors high, and the GTE building (now One Stamford Forum), along with the Marriott Hotel, the Stamford Town Center and many of the other downtown office buildings. One Landmark Square has since been dwarfed by the new 35-story Trump Parc condominium tower (topped out), and soon by the 400-foot 39 story Ritz Carlton Hotel and Residences development, another project by the Rich Company in partnership with Cappelli Enterprises. Over the years, other developers have joined in building up the downtown, a process that continued, with breaks during downturns in the economy, through the 1980s, 1990s and into the new century. Since 2008, an 80-acre mixed-use redevelopment project for the Stamford’s Harbor Point neighborhood has added additional growth south of the city’s Downtown area. Once complete, the redevelopment will include 6,000,000 square feet (560,000 m2) of new residential, retail, office and hotel space, and a marina. As of July 2012, roughly 900 of the projected 4,000 Harbor Point residential units were have been constructed. Stamford is situated near the southwestern point of Connecticut. It comprises a number of neighborhoods and villages including Cove-East Side, Downtown, North Stamford, Glenbrook, West Side, Turn Of River, Waterside, Springdale, Belltown, Ridgeway, Newfield, South End, Westover, Shippan, Roxbury and Palmers Hill. There are still a number of references to North Stamford as a separate town, but they legally and functional act as one town. Surrounding towns include Pound Ridge, New York to the north, Greenwich to the west, and both Darien and New Canaan to the east. Stamford, like the rest of coastal Connecticut lies in the broad transition zone between the cold continental climate to the north (Köppen climate classification: Dfa) and the more mild temperate/subtropical climate (Köppen Cfa), to the south. Coastal Connecticut, Long Island/NYC, and northern New Jersey are the general dividing line between theses two climate zones. The warm/hot season in Stamford is from May through late October. Average highs from April through early June are in the 60's and 70's F...while average highs are in the 80's F from mid June through early September. Late day thundershowers are common in the hottest months (June, July, August), despite the mostly sunny skies. The cool/cold season is from late November though mid March, with highs near 40 F and lows in the upper 20's F. Winter weather is far more variable than summer weather along the Connecticut coast, ranging from sunny days with high temperatures in the low 50's F...to cold and blustery conditions with occasional snow. Like much of the Connecticut coast and nearby Long Island, NY, some of the winter precipitation is rain or a mix and rain and wet snow in Stamford. Stamford averages about 30 inches of snow annually - while inland areas like Hartford and Albany average 45 to 60 inches of snow annually. 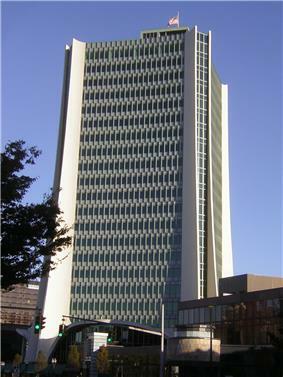 One Landmark Square, the second tallest building in the city, located in the heart of Downtown Stamford. Welcome sign in the city's Springdale neighborhood. Stamford possesses four islands in Long Island Sound: Grass Island, Greenway Island, Jack Island and Vincent Island. 06902 - Cove, East Side, Roxbury, Shippan, Shippan Point, South End, Waterside, West Side, and Westover. 06905 - Belltown, Hubbard Heights, Newfield, Ridgeway, Revonah Woods, Mid-Ridges, and Turn of River. The population density is 3,101.9 people per square mile (1,197.5/km²). Stamford has one of the highest educated populations in the US. Nine out of ten are high school graduates. Those possessing a bachelor's degree or higher is estimated at 45.9% of the population. Stamford is tied with Iowa City, Iowa for the US metropolitan area with the highest percentage of the adult population holding a bachelor's degree or higher; 44 percent of adults hold a degree. There are 47,317 housing units at an average density of 1,253.6 per square mile (484.0/km²). There are 45,399 households out of which 28.7% had children under the age of 18 living with them, 48.5% were married couples living together, 11.5% had a female householder with no husband present, and 36.2% were non-families. 28.7% of all households were made up of individuals and 9.8% had someone living alone who was 65 years of age or older. The average household size was 2.54 and the average family size was 3.13. Stamford is mostly Democratic, home to about 21,500 active registered Democrats and 14,000 Republicans in October 2005. The partisan ratio was 1.5 Democrats per Republican. 100 individuals were registered with minor parties, while roughly 20,000 did not have any party affiliation. The Mayor of Stamford is David Martin. Martin, a Democrat, was elected to a four year term in 2013, replacing Michael Pavia, a Republican who did not seek re-election to a second term. Prior to Pavia, the mayor was Dannel Malloy, the four-term Mayor who became Governor of Connecticut in 2011. Stamford is located on the main branch of the New Haven Line on the Metro-North Railroad, the commuter rail system for northern metropolitan New York City. 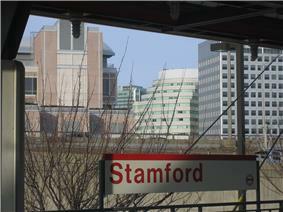 Stamford is the third busiest station on the Metro-North system and serves as a major transfer point for local trains. Stamford Station is also the terminus of a Metro-North branch that ends in New Canaan, 8 mi (13 km) away, and a part-time terminal of Shore Line East trains. Two smaller train stations in Stamford are Glenbrook and Springdale, both a part of the New Canaan branch. With a recent spike in development in the East Side neighborhood, the city is considering putting in a proposal to construct a new stop to service the East Main Street area close to the New Canaan branch overpass. Commuter trains come into Stamford from all points between New London to the east and New York (Grand Central Terminal) to the south. Several express (non-stop) trains leave Stamford each morning and evening for Grand Central. The average non-stop commute is forty-five minutes. Stamford has seen a significant increase in ridership. Much of this increase is a result of reverse commuting, individuals commuting from New York City to Stamford for work. Trains operate from the Stamford station between 4:43 AM (first departure to Grand Central) until 12:25 AM (last departure to Grand Central). On the weekends the first departure for Grand Central occurs at 5:03 AM. Fares during rush hour (on peak) are higher than during non-rush hour (off peak). On peak fares are charged between 4:43 AM – 9:10 AM for trains originating to Grand Central. Trains in transit to Stamford are charged on peak fares from 5:35 AM – 8:37 AM and from 4:02 PM – 7:40 PM. On peak fares do not apply on weekends and/or holidays. Tickets can be bought on board, yet the surcharge can make the price steep. Stamford also serves as a station along the Amtrak route. Acela, the high speed train service between Boston and Washington, makes several daily stops in Stamford. Amtrak's Regional (Springfield, Massachusetts to Washington, D.C.) and Vermonter (Saint Albans, Vermont to Washington, D.C.) also make daily stops in Stamford. Amtrak tickets can be purchased on the upper level of the Stamford station. Stamford is within 90 minutes drive of six airports: two regional, four international. Regional: Westchester County Airport (often referred to as White Plains Airport) which borders the town of Greenwich and Tweed-New Haven Regional Airport, in New Haven, Connecticut. 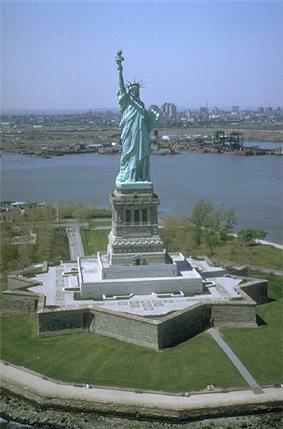 International: Bradley International Airport, located in Windsor Locks, Connecticut, LaGuardia Airport and John F. Kennedy International Airport both in Queens, N.Y., and Newark Liberty International Airport in Newark & Elizabeth, New Jersey. Greyhound provides some bus service from the lower level of the Stamford train station. 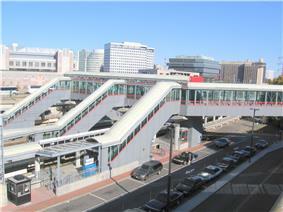 Same bus service is provided to New Haven (Union Station), Boston (South Station), and New York (Port Authority). Among the larger companies with headquarters in Stamford are WWE, Tasty Bite, Pitney Bowes, Gen Re, Frontier Communications, Starwood Hotels and Resorts Worldwide, Crane Co. and Charter Communications. UBS also has its North American headquarters here and its trading floor holds the Guinness World Record as the largest column-less trading floor in the world. The Royal Bank of Scotland moved its North American operations into Stamford in 2009, including its RBS Greenwich Capital subsidiary. In recent years, many large corporations have moved offices outside of the city due to the high rental cost, including Xerox, MeadWestvaco, International Paper, GE Capital, NBC and Clairol. The Harbor Point development, located in the South End, is one of the largest private-sector development projects in the United States. Many large retail stores, such as Design within Reach and Fairway Market have moved in, along with multiple hedge funds. Stamford was the ninth-safest city in the United States in 2006 (among cities with populations of 100,000 or more), up from the 11th safest in 2005, according to the FBI. The 2006 ranking represented the sixth consecutive year the city ranked in the top 11. FBI crime statistics for the city showed crime went down 1.7 percent in 2006 because of a plunge in property crimes. But the rate of violent crime went up by a total of 29 percent in the two years 2005 and 2006 combined. The increase was due in part due to violent gang battles, often on the West Side. Criminal cases are prosecuted by The State's Attorney's Office and Stamford is home to a State Superior Court which is located on Hoyt Street. A not-for-profit agency, Stamford Emergency Medical Services (SEMS) provides pre-hospital emergency care in Stamford, Connecticut. SEMS also provides contracted paramedic intercept response to Darien Emergency Medical Services, located in Darien, Connecticut. SEMS is the only Connecticut EMS service accredited by the Commission on the Accreditation of Ambulance Services (CAAS). All SEMS units are staffed by at least one Connecticut-licensed paramedic. Stamford EMS responds to 13,000 calls annually. Fire protection in the city of Stamford is provided by the paid Stamford Fire Rescue Department(SFRD) and 5 all-volunteer Fire Departments: Glenbrook-New Hope, Belltown, Springdale, Turn of River, and Long Ridge. The Stamford Fire Rescue Department operates out of 7 Fire Stations(including 2 Substations) and share quarters with 2 volunteer fire departments(Glenbrook-New Hope and Springdale). The SFRD's primary response district includes the southern, more urban sections of the city, including Downtown, East Side, West Side, Woodside, and South End areas of the city. The 5 all-volunteer fire departments' primary response districts include the Northern, more residential sections of the city, from Downtown to the New York State border. The SFRD's 290 paid members staff a total of 9 Engines(including 2 Quints), 3 Trucks, 1 Heavy Rescue, and a Deputy Chief's Command Vehicle. The Stamford Fire Rescue Department responds to over 11,000 emergency calls annually. The 5 all-volunteer fire departments each operate 1 to 2 Fire Stations in their own tax districts. The volunteers mann a combined apparatus fleet of 14 Engines, 3 Trucks, 5 Rescues, and their own Command Vehicles, as many other special units and respond to all calls in their respected districts in conjunction with the paid fire department. Budgeting and districting of the various fire departments throughout the city has been unstable since 2007, due to an extended legal conflict between the volunteer departments and the Malloy administration. As of May 16, 2012, a decision was reached by the city's charter revision committee to combine the paid and volunteer fire departments into one combination fire department, known as the Stamford Fire Department. The new department would be headed by a paid Chief of Department, appointed by the mayor, and 2 paid Assistant Chiefs, 1 appointed by the mayor to oversee the operations of the paid wing of the new department, and 1 appointed by the volunteer fire companies to oversee the operations of the volunteer wing of the new department. The joining of the paid and 5 all-volunteer fire departments would promote better public safety for the city, a smoother incident command system, and a better incident response system. The Stamford Police Department(SPD) is Stamford's only police force and has lost four officers in the line of service since 1938. The 2008 force was composed of 1 chief, 2 assistant chiefs, 7 captains, 11 lieutenants, 52 sergeants, 215 officers and 67 civilian employees. Aside from Police Headquarters, located at 805 Bedford St. in Downtown Stamford, SPD also operates substations in Stamford's West Side at Wilson St. and W. Main St. and at 1137 High Ridge Rd and Hope Street. The current Chief of Police is Jonathan Fontneau. Stamford has branches of the University of Connecticut, University of Bridgeport and Sacred Heart University. The University of Connecticut's campus is located in a large modern building in downtown that opened in 1998 after extensive renovations to an abandoned former Bloomingdale's store that closed in 1990. The branches of the University of Bridgeport and Sacred Heart University are located in the River Bend Executive Center, Fairfield County's premier communication and information high tech park. All are commuter campuses. Stamford has several public high schools, Westhill High School, Stamford High School, and the Academy of Information Technology and Engineering. The city also has several private schools, including King Low Heywood Thomas, The Long Ridge School, Trinity Catholic High School, Villa Maria School, and Bi-Cultural Jewish Day School as well as two state charter schools: Trailblazers Academy Charter Middle School and Stamford Academy Charter High School, both operated by human services nonprofit Domus. The New England Force, a professional soccer team based in Stamford, will make its debut in the American Soccer League in August 2014. Cummings Park, a public beach, was once a popular spot for shellfishing. The park, developed in 1906, previously was known as Halloween Park because Mayor Homer Cummings cast the deciding vote to create it on Halloween Night. Terry Connors Ice Rink shares a parking lot with Cove Island Park. It offers public ice skating for all ages and ability levels, group lessons, and ice hockey. It is the home of the Stamford Youth Hockey Association . Open skating is scheduled regularly, and costs are $6 for children or students and $8 for adults. Skate rentals are also available for $4. Scalzi Park on Bridge Street has a playground, baseball and softball fields, volleyball courts, tennis courts, bocce courts, basketball courts, roller hockey courts, and a baseball stadium named "Cubeta Stadium." Stamford baseball leagues play baseball there. J.M. Wright Technical High School is next to the park. A skate park was opened at Scalzi in July 2007. The city sought input from users in planning the $309,850, concrete skate park and hired Grindline Skateparks Inc. of Seattle, Washington to provide a unique design and build it. Stamford has two municipal golf courses. Sterling Farms Golf Course opened in May 1972 and is the more popular of the two courses. The facility also has a driving range, restaurant, and six tennis courts. In the fall of 2005, Sterling Farms began Phase 1 of an extensive renovation project which will result in improvements to the entire golf course and adjacent facilities. Each fall and spring since 2005, 3 to 4 different holes have been renovated resulting in new tees, bunkers and cart paths. At this point, the entire front 9 has been completed and the back 9 is well underway. All is expected to be completed in the fall of 2010. E. Gaynor Brennan Golf Course, referred to locally as Hubbard Heights, opened for play in 1922 as a private course and was purchased by the city in 1949. A long range Master Plan is currently being designed by Stephen Kay - Doug Smith Golf Course Design and renovation work is scheduled to begin in the fall of 2010. OLIN (the same firm that designed Bryant Park in New York) is complete or nearly complete. Dorothy Heroy Park Is located in North Stamford, just south of Pound Ridge, NY. The Gutzon Borglum, the sculptor of Mount Rushmore, who was a Stamford resident for a decade. Stamford Center for the Arts: The Palace Theatre, originally opened as a vaudeville house in 1927, reopened as a nonprofit theater in 1983. It was joined in 1992 by the Rich Forum, another downtown venue. Both have been run by the Stamford Center for the Arts. The Rich Forum is now being rented by NBC Universal as a television studio. Bow Tie Cinemas has two first-run movie houses in Stamford with a total of 15 movie screens: Landmark 9 and Majestic 6. On February 13, 2004, the Avon Theatre Film Center, a 2 screen nonprofit movie house focusing on first-run independent films, opened in the historic Avon Theatre on Bedford Street. In Springdale, the two-screen State Cinema, run by Garden Homes Cinemas of Stamford, also shows first-run films. The Ferguson Library also shows films. Franklin Street Works maintains an art space in the downtown area. NBCUniversal moved the offices of its sports division to Stamford from the company's Rockefeller Center headquarters in Manhattan. All studio shows are now based out of Stamford, including Football Night in America. In addition, three of NBCU's syndicated programs relocated to the Rich Forum Theatre: Maury came to Stamford from New York City, while The Jerry Springer Show and The Steve Wilkos Show were previously based in Chicago. The Yes Network headquarters is in Stamford. WWE has its international headquarters in Stamford. The TBS sitcom Are We There Yet was filmed at the Connecticut Film Center located in Stamford. The fictional movie, Take My Hand, from the episode, I Heart Connecticut of the NBC show 30 Rock was set and filmed in Stamford. Stamford Advocate, daily newspaper, owned by the Hearst Corporation. ^ Godbeer, Richard (January 2005). "Chapter 1: Katherine Branch's Fits". Escaping Salem. Oxford. ^ "Climatography of the United States No. 20: STAMFORD 5 N, CT 1971–2000". National Oceanic & Atmospheric Administration. Retrieved 2011-12-07. ^ "Monthly Averages for Stamford, CT (06902)". The Weather Channel. Retrieved 2011-12-07. ^ "State of Connecticut, party affiliation" (PDF). Archived from the original on 2007-12-01. Retrieved 2007-12-18. ^ "Registration and Party Enrollment Statistics as of October 25, 2005" (PDF). Connecticut Secretary of State. Archived from the original on 2006-09-23. Retrieved 2006-10-02. ^ RBS employees expected to move into new headquarters this month, The Advocate, 03 March 2009. ^ Harbor Point Spurs Stamford’s Economic Growth with Thousands of New Jobs. Prweb.com. Retrieved on 2013-07-15. ^ SEMS Online - The Official Site of Stamford Emergency Medical Services. Stamfordems.org. Retrieved on 2013-07-15. ^ International Trade Council... Overview. Stamfordchamber.com. Retrieved on 15 July 2013. Huntington, E.B. (1868). History of Stamford, Connecticut: from its settlement in 1641, to the present. Stamford, CT: The Author. Burns, Rosemary (1982). Springdale remembered : the history of a section of Stamford, Connecticut, 1640-1949. Stamford, CT: Stamford Historical Society. Majdalany, Jeanne; Wicks, Edith (1992). The story of the early settlers of Stamford, Connecticut, 1641-1700. Bowie, MD: Heritage Books.